Michelle Cahill is an award-winning poet and fiction writer and editor of Mascara Literary Review. Cahill has won the Val Vallis Award and the Hilary Mantel International Short Story Prize. Her debut short story collection, Letter to Pessoa, was published by Giramondo Publishing in 2016, and won the NSW Premier’s Literary Award for New Writing. Her new book of poems, The Herring Lass, is published by Arc. 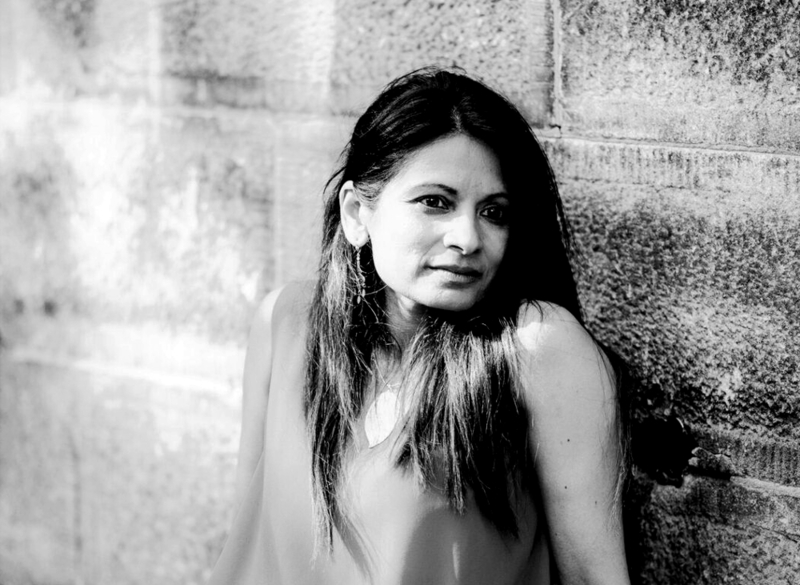 She is a Doctoral Candidate in Creative Writing at the University of Wollongong; her research interests are in metafiction and the Anglo Indian diaspora. The subject of my interview with Cahill is her second book of poems, Vishvarūpa, which is a highly unusual book by a contemporary Australian poet. In Vishvarūpa Cahill reanimates figures from ancient Hindu mythology. Cahill takes Hindu gods and goddesses and drops them into suburban Sydney, and into various Indian cities. The poet adopts the voices of Hindu gods in the first person, in poems such as ‘Pārvatī in Darlinghurst’ and ‘Laksmi Under Oath,’ and writes them into poems in the third (‘Hanuman,’ ‘Sita’). Vishvarūpa is an experimental rendering of myth that is well known, in its conventional form, to Hindus, but would be relatively unknown to the Australian or Western reader; it contains a comprehensive glossary for this reason. The book draws on the Mahābhārataand the Rāmāyaṇa – Hindu narrative epics – and philosophy and scriptures in the Vedas. Cahill’s own background is Christian, as she tells me, although her ancestors were Hindus before India was colonised. As such, Vishvarūpa is the poet’s attempt to reconnect to a Hindu tradition that is in fact part of her heritage. Cahill has Goan-Anglo-Indian – or Eurasian – ancestry, and cultural identity is a prominent theme in her work. I wanted to speak to Cahill about Vishvarūpa in particular because it is rare for an Australian poet, not to mention an Anglo-Indian, to engage deeply with Hindu mythology and philosophy in their work. While the artistic practice of adapting Hindu mythology is common in India, particularly among Hindus, it is uncommon in other countries and among other peoples. The contemporary Australian poet Susan Hawthorne embarks on a slightly different mythological quest in her 2011 collection Cow – which focuses on mythology around the figure of the cow in India and in ancient Greece, and is told through the perspective of a cow named Queenie. In our interview Cahill also mentions a few contemporary diasporic Indians who have reworked the Hindu narrative epics. We spoke about a range of subjects in relation to Vishvarūpa, including cultural identity, feminism, and travel, but with a particular focus on Cahill’s poetic adaptations of Hindu mythology in the book. Prithvi Varatharajan: Firstly, could you tell me more about the title of the collection, Vishvarūpa, about what it means in Hindu mythology, and why you chose it for the name of the book. PV: What Hindu literatures do you engage with in Vishvarūpa? MC: The main literary text that I engaged with is a translation of the Bhagavad Gita by Christopher Isherwood and Swami Prabhavananda. In length it is about 700 verses long and much of it concerns a dialogue between Lord Krishna and Arjuna. On the eve of the battle at Kurukshetra, Krishna speaks to Arjuna that there are two paths to spiritual realisation: the first being a contemplative path and second being an active path. He advises that if you follow either of these paths to the end they lead to the same place. I was curious about this because I had written about perception and about Buddhist meditation in my first collection, The Accidental Cage (2006). In Vishvarūpa, I wanted to bring focus to a more active and a more rhetorical spiritual practice than Buddhism, and how the Hindu pantheon engages different energies. Krishna advises Arjuna to go into battle and commit a crime of domestic violence, to slay his cousin. So the notion that sometimes we have to be offensive as well as oracular, in poetry and in writing and in our real lives – that was compelling to me because it leads to the paradox of impurity, probably best described in the poem, ‘At West Head.’ Questioning cultural ‘purity’ becomes one of the deeper energies that runs through the book as it navigates through the relations and facets of post-identity. And there are some Portuguese words interjecting with English, such as ‘balaidera’ and ‘varandah,’ filtering linguistic fusions through the verse. PV: Can you explain where the Bhavagad Gita sits within the Mahābhārata? MC: I am not an expert on the Mahābhārata, or Sanskrit texts. Neither am I a third or fourth generation ‘almost’ Brahmin Hindu. I reject a fixed identity or a caste. This book is about retracing my own deracination or separation from a non-material episteme that would have been a way of life for my ancestors in an unrecorded history. Colonisation’s ruptures are temporal and cultural; a conversion to a Christian and Westernised spirituality and social practice most impacted those of mixed ancestry. Conversions were inevitably for political reasons in the seventeenth century when the British were competing with the Portuguese and the Dutch for stakes in India. Vishvarūpa is about traveling back through myth and memory to reconfigure a partially imagined and a partially real identity, from what is basically an identity crisis. As a poetic text it invites a documentary as well as an imaginative reading. My research involved reading some books but mostly I read online. I did compare the Sanskrit transliterations, with some scrutiny. I thought about how I could use transliterations in the book; what they could signal in terms of a language being absent; how the linguistic element could be reconfigured as motif. There is a manipulation of these aspects, which shapeshifts and liberates the colonised speaker, stemming from the watershed between myth and history. That is the point I make in the poem ‘Reading the Mahābhārata’: that myth is not merely decorative. Like historical fiction, it has the potential to inhabit archival gaps. In the last stanza there are echoes of Keats’ ‘Ode on a Grecian Urn,’ a poem which inhabits the liminality of ancient, unearthed pottery. PV: What I was getting at is that the Bhagavad Gita is a philosophical tract within the Mahābhārata – which is this epic story set on a battlefield – isn’t it? MC: Yes, that’s right. So Arjuna has to go to war to kill his cousin, and that’s when he has this crisis. Lord Krishna appears to him, and reappears as a cosmic, with a myriad of different faces, with snake heads and halos. It’s described as ‘many mouths and eyes, and many visions of marvels, and ornaments and weapons’. And the incident is where I took the title of the book from. It sparked something for me about the tensions and ambivalences within identity, and also about inherent possibilities, the latent multiplicity in consciousness and in objects. That’s something I am interested in theoretically as well, in my writing. PV: In my reading of the collection, I also saw the word as a metaphor for postcolonial identity. These many forms in one that you, Michelle Cahill, might have. I was thinking that you as a poet, and as a person, might have these masks that you adopt at different times: as an Indian, as an Anglo-Indian, living in Sydney and drawing on various cultures. Does that chime with what you were thinking? MC: Not deliberately. I wasn’t thinking of myself. I am not a confessional poet. However, I have been interested in diversity and hybridity in my work, as an editor, as a writer. And I continue to think about the contradictions in contemporary Australia. What is my relational position as a migrant Indian to this culture? Going by last year’s census, our demographics are convincingly multicultural, but our literary identity has remained fairly homogenised. Furthermore our poetry until recent years has been almost exclusively white, a settler poetics. I would say Australian poetry is even more elitist and biopolitical than Australian fiction. So I was interested in the mythological tensions that provoke a working concept of belonging. Using a non-English word, which happens to mean ‘many forms’ was a small provocation as well as a unifying theme. PV: Some of the poems in Vishvarūpa have a feminist voice that emerges through mythic figures like Pārvatī and Sīta. To what extent would you describe Vishvarūpa as a feminist retelling of ancient Hindu stories? MC: When I started to write the book I decided to write through the lens of Hindu divas. I think my ‘Kālī from Abroad’ and my ‘Laksmī Under Oath’ are punchy. As I became more skilful and more comfortable with using the myths as a space for writing these personas, I could see that there were endless possibilities. And so poems like ‘Pārvatī in Darlinghurst’ and ‘Durgā: a Self Portrait’ did emerge out of philosophical ponderings on gender. And yes, I think it’s definitely a feminist version of the Vedas in that regard. Pārvatī is supposed to be the ideal composite to Shiva, the perfect wife – obedient and passive. This gets subverted, so Parvati takes authority of her self-image, rejecting the controlling element in romantic love as misogyny. The humour is also assured and scornful. This entry was posted in INTERVIEWS and tagged Michelle Cahill, Prithvi Varatharajan. Bookmark the permalink.